Wow! I've never seen one of those before! My son was taking some bug type course at UNM and had to classify as many bugs as he could find. I sent him a carpenter bee. This bug of yours would have been great. It's really quite pretty. I've never squeezed a stink bug so I don't know what it smells like. I'm curious. Kay- two things entered my mind almost simultaneously, that some nincompoop, perhaps in my own apartment building, brought a new species of bug to the islands in his belongings, and secondly, it's a magic bug that eats household roaches, and will eradicate the all the roaches from the island. 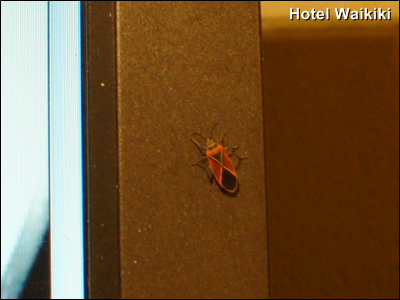 That looks like some variation of a Box Elder Bug. Alan- I didn't see your comment until now. I did a google for "Box Elder Bug," and indeed they have a very similar coat of arms marking. Never ever saw them before. New bug though cannot be good.